Euro cylinder lock change offer in Erith Belvedere Bexley Thamesmead Dartford Kent and our surrounding areas. Affordable Locksmiths 24-7 have an outstanding offer at the moment on our euro cylinder lock rang that cannot be missed. Please give us a call if you in need of changing your locks the cost is less than you think at affordable locksmiths 24-7. 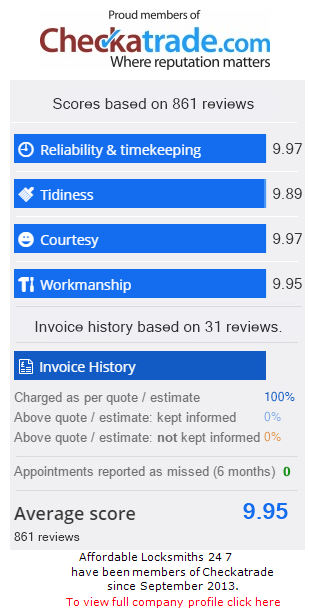 We are very proud of our high score at Checkatrade. A very helpful and prompt locksmith service. We are Enhanced CRB Checked.